In Coventry Vineyard we welcome everyone to join us, whatever your faith, background or lifestyle. Our focus is on showing our generation how to follow Jesus and we want everyone to know how amazing He is, and how He has made a way for us to start a new life as children of God. If you decide to accept Jesus’ sacrifice for your sins and His free gift of salvation, the next step is to make a public declaration of your decision. Baptism is the way to tell the World and God that you want to make a life long commitment to Him. The baptism waters are not magical, but they are symbolic. They symobilse you deciding to put your old life to death and start a new one as a creation of Christ. They are also symbolic of being washed clean from your past sins. Baptism is a great opportunity to invite friends and family to see the decision you have made, hear your story of how God has changed your life, and see how important your decision to follow Jesus is to you. When do I get Baptised? When you decide to follow Jesus. What should I do if I want to get baptised? Tell your life group leader or Sunday team leader that you want to get baptised, or email office@coventryvineyard.org.uk We usually have baptisms on Easter Day (March/April) and in October, but can sometimes add in another date if there are others wanting to get baptised too. Once you have booked in to get baptised and have been given the date, invite all of your friends, family and work colleagues. The idea is to make a public declaration, so it is good to get as much of the 'public' there as possible. Pray: spend time with God and ask Him to guide your plans. Let God know that you are serious about doing the job he has for you and ask Him to equip you to do it. Ask your life group and any other Christian friends to pray with you during the weeks leading up to the baptism. Come to a Pre-Baptism 'class': this explains the significance of baptism, helps you understand what it is a follower of Jesus believes and what life after baptism should look like. You will be fully immersed in water so are going to get very wet. Don’t wear white clothes (can become very see through) or a loose fitting dress (can trap air and float up). Decide who you would like to have baptise you. Usually Nick or Vicki are one of the people baptising, and then the other person is someone who has helped you in your spiritual journey (often a life group leader or close friend). You will also need to decide who will hold the towel for you for when you first get out of the water. What happens when I am baptised? 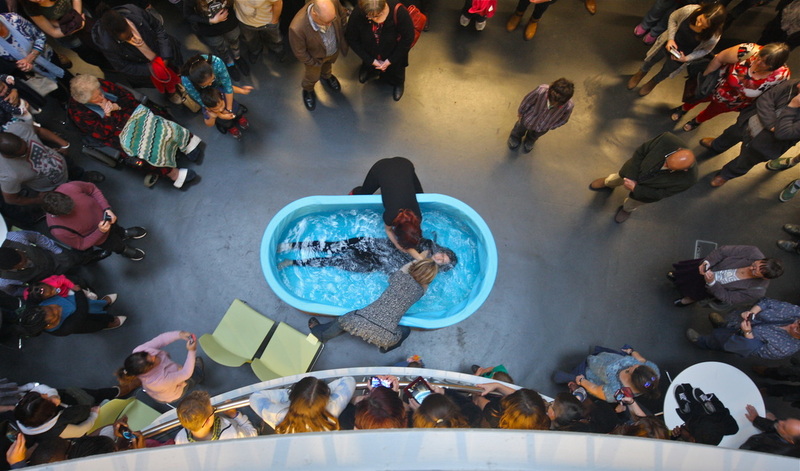 You will be baptised in a pool, and will be able to step in with some help if you require. A person will stand each side of you and you will be lowered, back first, into the water until fully immersed. You will then be helped upright and can step out of the pool to your friend with a towel. After everyone is baptised, we gather round and pray for you. This can be very powerful and moving for the person being baptised. You may feel the Holy Spirit on you, or you may not- this doesn’t mean He is not there. Being baptised is not about feelings, it is about making a declaration of faith. ​If you are interested in getting baptised or finding out more, please fill in the connect form and we will get back to you as soon as we can.